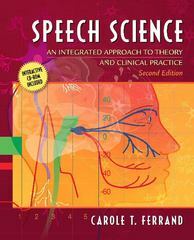 Speech Science 2 Edition Speech Science integrates scientific material on the acoustics, anatomy, and physiology of speech production and perception with state-of-the-art instrumental techniques used in clinical practice. Each chapter presenting theoretical information is followed by a corresponding chapter on clinical application, demonstrating the connections between scientific theory and clinical management of communication disorders. To reinforce this link, case studies and questions in each clinical application chapter help students focus on how scientific principles are applied in clinical contexts. Call-out notes, summary points, and review questions help students consolidate material for improved retention. Schematic illustrations enhance the text and demonstrate anatomical and functional relationships between structures. With this student- and instructor-friendly text, students will find theoretical information meaningful, less intimidating, and more easily accessible. The Second Edition features two new chapters on neurology that present a comprehensive yet targeted discussion of neuroanatomy and neurophysiology relevant to speech production (Ch. 12) and examine current brain imaging techniques (Ch. 13). In each clinical application chapter, case studies and follow-up questions reinforce the link between science and clinical application. Pedagogical aides such as call-out notes in the margins have been included in all chapters to underscore important concepts. Plus, this edition comes packaged with a new DVD to accompany the text that provides visualizations of many important concepts, as well as self-test quizzes for students to evaluate their understanding of the material.